Yeah, we thought with a name like "Barbus" it would be a lot cooler too. 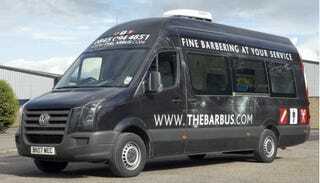 But as it turns out, Oxfordshire-based Barbus actually uses its Volkswagen Crafter panel van to provide mobile haircutting services throughout Britain. That's not to say that the Barbus van isn't pretty sharp for what it is: The interior features two leather salon chairs, mirrors, electric outlets and even a bathroom. It's just not as good as it could be.